The pharmaceutical and healthcare industries are highly regulated and present significant challenges for management and specialists. They are required to have ready access to, understand and be familiar with this mandatory body of law and policy – and importantly, to be responsible for effective compliance especially regarding medicines, medical devices and dispensaries. Fulfilling this need in the market for a practical tool for pharmacy and health products regulation and compliance, Juta has developed Pharmapedia, a one-stop online service for meeting customers’ legislative and regulatory obligations. Compliance with medicines and pharmacy law just got easier! Pharmapedia uniquely integrates and links seamlessly between the vast array of health professional and product legislation and policy documentation. This is indexed and intuitively cross-referenced under subject headings, processes and themes for ease of use. Useful Practice Notes and Quick Guides by managing editor, Val Beaumont, consolidate the guidelines and clarify the implementation of legislation and compliance requirements, taking the complexity out of compliance. These empowering guidance tools cover industry regulatory needs, controls over the selling, prescribing and dispensing of medicines, and a fully indexed and updated Good Pharmacy Practice (GPP) Toolkit. Accessible on any device via the internet, Pharmapedia is continuously updated for reliable content at your fingertips – no filing up of annual loose-leaf update supplements required. Subscribers will also receive a free print 2018 handbook containing the compulsory legislation for pharmacists and pharmacies. Pharmapedia complies with the requirements of the South African Pharmacy Council (SAPC) for compulsory on-site legal texts for pharmacies and pharmacists. Offering more content, choice and value, Pharmapedia’s three-tiered subscription options (Essential, Premium and Premium Plus), give customers tailored access according to their information needs and budget. Val Beaumont M.Pharm (Industrial Pharmacy), FPS, specialised in industrial pharmacy and has extensive practical experience in regulation and compliance across the broad pharmaceutical arena. She is the Executive Officer of the Marketing Code Authority for the ethical marketing of health products and consults to the health sector on strategic, regulatory, policy, ethics and technical matters related to medicines. Her contribution to the profession of pharmacy has been acknowledged through the award of Fellowship of the Pharmaceutical Society of South Africa. For a limited period we are running a subscriber launch offer giving registered users a FREE TRIAL to Juta's Pharmapedia. 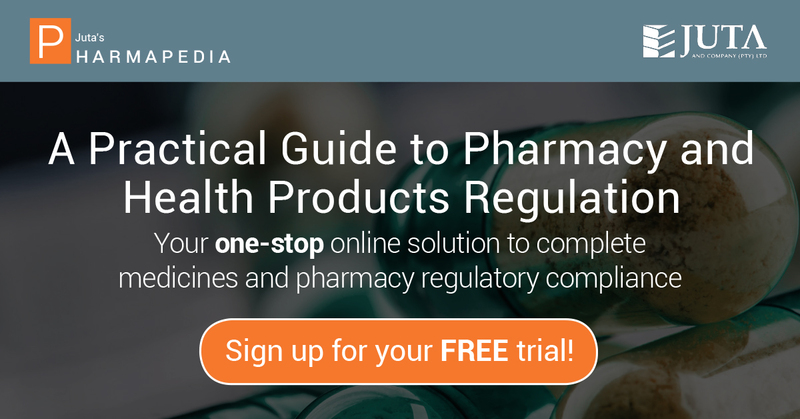 Get access to this ground-breaking online guide to medicines and pharmacy regulatory compliance developed for those who negotiate a complex array of health products and health professions legislation, guidelines, regulations, rules and policies. To claim this offer simply click the image below and head to head over to registration page or alternatively click here.